Sport, whether it’s a team game such as football or rugby, or an individual past time such as running or golf, is played by millions of people all around the world. 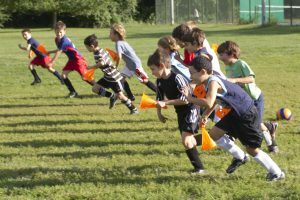 You may not currently be into sport, so, in this article, we’re going to give you three easy ways to let you know how you can make it more enjoyable for your children. Sport plays a vital role in teaching fair play, respect and discipline, so encourage your child to buy into this. They should, for example, shake the hand of their opponent both before and after any game, and learn not to be a ‘sore loser’ or even a ‘bad winner’. You should applaud both teams for any good play, and also thank the coach and officials once the game is finished. Parents screaming from the touchline can really put children off enjoying football. By all means, be enthusiastic and support your child, but don’t shout and scream, and don’t be negative when you’re standing at the side of the pitch. Also, it undoubtedly goes without saying, but you should never use bad language or harass other people while you’re watching your child play. For many people, sport is just about winning, but for many others, the beautiful thing about it is the way it encourages people to socialise and be included in a fun and active environment. Your child needs to find their own way in sport and decide what it’s all about. So, don’t just make it purely about the winning; if they lose, it shouldn’t be the end of the world. So there you go, the above are just a few easy ways to make sport a lot more enjoyable!